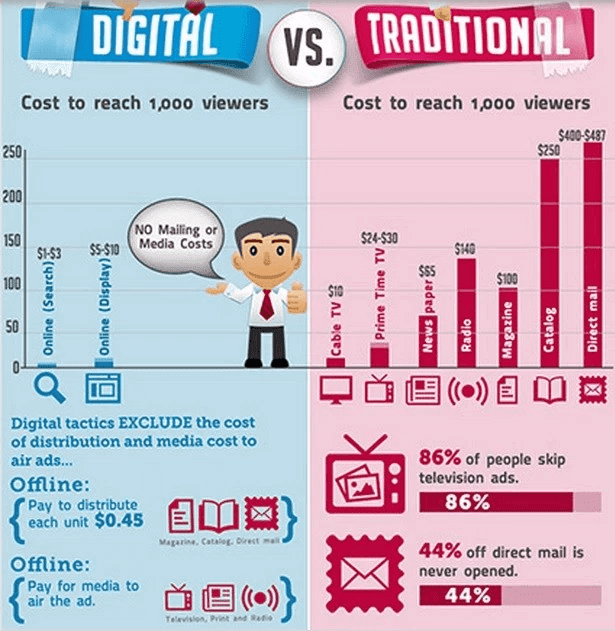 Digital marketing is a very important aspect of marketing comprise of Email, SMS, push messages, etc. SendPulse is an integral service provider which provides complete services. Here in this SendPulse Review, I will share all the details about the platform and how to use SendPulse. Marketing has made a great drift from offline marketing to online marketing nowadays. I am not saying that offline marketing is not working, but online has become a place for more visibility. Especially if you are targeting the middle-class or upper-middle-class customers, online advertising and marketing can be very crucial. If you analyze the marketing expenditure of any company for past few year, you will find online market has almost acquired the traditional marketing. One of such report is as below. There are many reasons behind this. For example, the ROI is more. Another thing is the budget. To acquire the same amount of customer, you’ll have to spend less in online marketing. Here is the data used to acquire 1000 customers from both digital marketing and traditional marketing. But the problem arise when you have to buy different services from different companies. But recently, I found one company SendPulse which is an all in one web marketing solutions like email marketing, SMS, Web Push, and many other features. Depending on the niche, the open email rate varies. But if we talk about the average open rate for emails, it comes somewhere around 15-20%. But many SendPulse users have achieved more than 30% of open email rate. This is possible because SendPulse uses AI for the operation and enhancements. Let’s start with the SendPulse Review and see how it is going to help you in digital marketing. SendPulse is one of the fastest growing companies in the digital marketing field. They help you to send emails, SMS, web push, and SMTP email that will help you grow your business. 24x7 support and a dedicated team of support engineers are always ready to help you in any situation. SendPulse has over 250k customers including bloggers, internet marketers, and business owners. Now let’s start with the products of SendPulse which makes online marketing easy. SendPulse provides one of the best email services with some excellent features. Below are the SendPulse email service features. Drag & Drop email editor: SendPulse provides a quality email editor using which you can design a responsive and converting email template. You can first select the template available with them depending on the niche and then start customizing it as per your need. 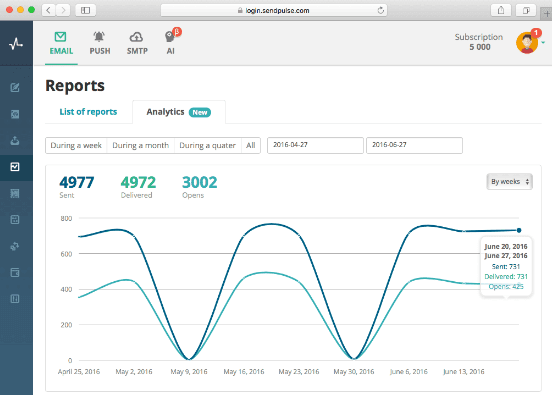 Readymade Templates: SendPulse provides hundreds of free templates in different categories. You can use those templates as and when required. These templates have been designed using HTML and CSS, and so you can easily edit and use those. You can check the below video to see how you can create newsletter template easily. A/B Testing: This has become one of essential features nowadays with email marketing software. You can use different combinations of emails while sending and can see which is performing well for you. Automated Email Sending: For better personalization of your emails with the customers, this features help a lot. You must have absorbed whenever you signup any website, you receive some emails. These are the features of automated emails. For a successful email marketing, one should use this feature very wisely. You can also check best welcome email templates. Reporting: Once you send the email, you can track the status like how many readers opened the email, how many of those clicked on the link, etc. This is very much required to grow your business. Using this, you can send the SMS all across the world easily. 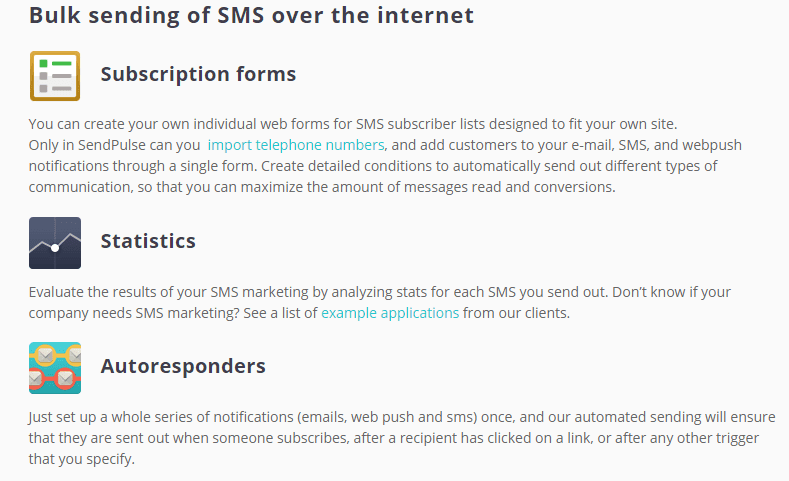 SendPulse allows you to send 10 SMS free which you can try. Web push notification is a new and very effective form of online marketing. It helps more as once your reader will subscribe to get the push notification; they will keep on getting the alert once you’ll publish any new posts. This is a free service by SendPulse, and you will get $5 every month for using web push message. Such notifications now work with over 80% of the web browsers including major like Chrome and Firefox. To add the push message on your website, you just need to add a simple line of code. SendPulse also provides Rest API for developers. You can easily integrate push notifications into your CMS, CRM, or another system. You can automatically send personalized web push messages to your customers from the system you already use. For email services, if you are having less than 2500 email list and just want to send 15000 emails per month, you won’t have to pay anything. For subscribers above 2500, their pricing plan starts at $26. The pricing of SMS services depends on the country. For example, in the USA it is $0.035 per message. And web push notification is free for forever. 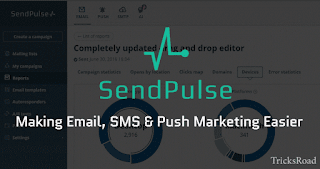 SendPulse is an all in one internet marketing software providing email, SMS, web push, SMTP services at a very affordable price and great features. You can easily integrate their tools with the tools like Bitrix24, WordPress, etc. to get the best of it. So if you are starting with email marketing services and have a list up to 2500, use SendPulse for free.